Personal Archive is a specialized mailbox associated with a user’s primary mailbox. It appears alongside the primary mailbox folders in Outlook or Outlook Web App, giving users direct access to archived email in the same way as non-archived email. 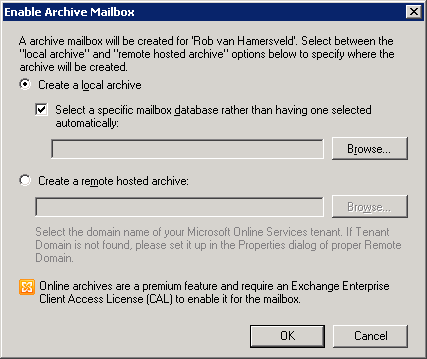 For example, users can search both their Personal Archive and primary mailbox using Outlook or Outlook Web App. 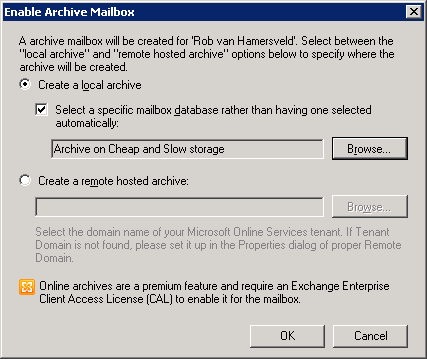 Email items from the primary mailbox can be automatically offloaded to the Personal Archive through retention polices, and administrators can also import historical email data from .PST files directly into Exchange. 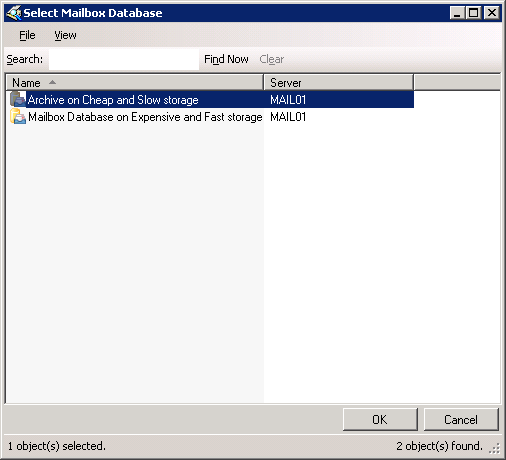 * With the flexibility to provision a user’s Personal Archive to a different mailbox database from their primary mailbox*, organizations can more easily implement separate storage strategies for less frequently accessed email. *Available with Exchange Server 2010 Service Pack 1. This feature was a real step forward in e-mail archiving, except that the real cool functionality (storing the archive in a different mailbox database) will be available with SP1. But there is good news, on August 24 Microsoft released SP1 for Exchange 2010. So the time is here to see if they made the chances we were all waiting for. After downloading and installing SP1 (download: http://www.microsoft.com/downloads/en/details.aspx?FamilyID=50b32685-4356-49cc-8b37-d9c9d4ea3f5b&displaylang=en) I created a new mailbox database on some (cheap and slow) SATA storage, this database will I use to store my archives. 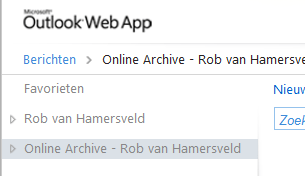 In Outlook Web App the user will be presented with the ‘Online Archive’ folder. You can also apply GPO’s the force archiving to this folder. I didn’t had the time to test it with Office Outlook 2010.